I Know What You Did Last Raya! There will be Lucky Draw where prizes include iPods (Touch & Nano), thumb drives, T-shirts etc. Safer Internet Day (SID) is an initiative by INSAFE, a network of national nodes that coordinate internet safety awareness in Europe. The network is set up and co-funded within the framework of the European Commission’s Safer Internet plus Programme which comprises four action lines. Safer Internet Day 2010 (SID 2010) under the theme “Think before you post”, SID 2010 will focus on how we're managing images online and consequently, how we deal with privacy in digital environments. 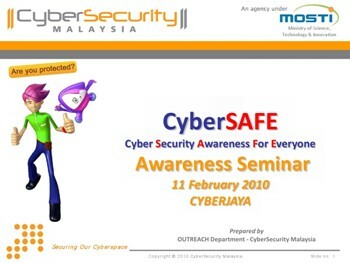 Following up from Outreach’s participation at the annual Safer Internet Forum at Luxembourg in October 2009, CyberSecurity Malaysia has been appointed by INSAFE as the Lead Organisation for the celebration of SID 2010 in Malaysia.